Few things are more of a vintage tradition than supporting local culinary (both harvested and produced) offerings, so I was glad that I finally got around to visiting the Somerville Winter (Indoor) Farmer’s Market at the Armory last weekend, despite the fact that it was the final one. Whoops! Once inside I was greeted by the warm and cozy bustle of sellers and shoppers. We Bostonians are sick of winter already and there’s nothing like a substitute farmer’s market to remind us that warmer days are coming…eventually. The Fiore di Nonno homemade mozzarella cheese I had hoped to pick up was sold out by the time I arrived, but I was consoled by a stash of Taza Chocolate and Q’s Nuts. Taza is one of the shiniest jewels in Somerville’s local crown. Co-founders Alex Whitmore and Larry Slotnick knew when they started Taza in 2006 that it would be “a company with a conscience”. 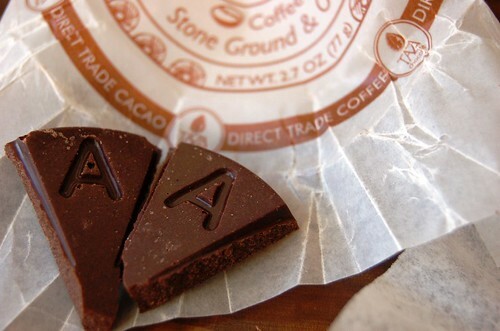 They live up to that goal by producing stone-ground, organic chocolate using quality ingredients while compensating growers fairly for their work. The result is an impressive assortment of bars, discs, treats, and gifts. Because I can’t resist anything coffee, I went with the Counter Coffee Chocolate Mexicano 2 disc “bar” (the only ingredients are 1. organic roasted cacao beans 2. organic cane sugar, and 3. organic coffee) and a stash of their 70% dark stone ground chocolate baking squares, which I will be using and sharing in a recipe very soon. Taza’s chocolate is truly memorable. Its purity of taste and slightly gritty texture won’t be familiar to Hershey palates, but once the initial surprise wears off, I think you will find yourself accepting no substitute. You can’t miss Taza’s beautiful packaging and logo, designed by their own brand manager Kathleen Fulton. For more info or to order online, visit their site or check out this write-up from the February 2009 Gourmet magazine, which rightfully praised Taza for its adherence to “old-world purity”. I quite agree. This was my first time trying Q’s Nuts, but they made a great impression. Roaster extraordinaire Brian Quinn is friendly, knowledgeable, and happy to provide sample after sample of anything you want to try (which I did). I finally settled on two exotic varieties to bring home – one spicy and one sweet. 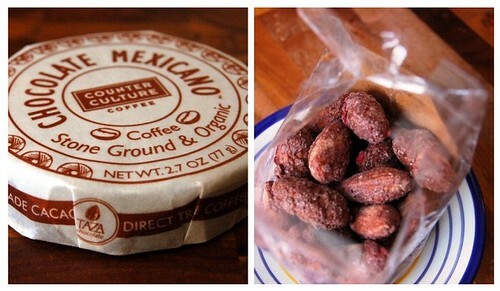 Q’s has a great variety of traditional sweet roasted nuts, but the exotics were too tempting to pass up. 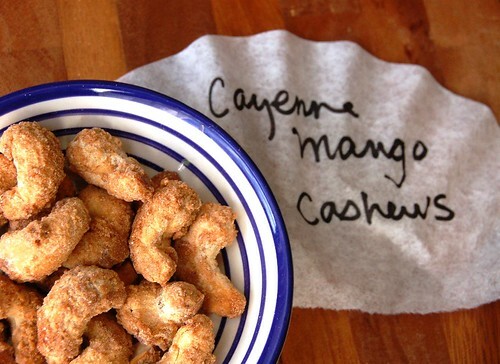 My spicy selection was Cayenne Mango Cashews, which took me a little longer to eat because of the spice factor, but I love sweet and spicy together (think pineapple salsa) so I still thoroughly enjoyed them. Other exotic flavors include Key Lime Ginger, Mexican Chocolate, Banana Foster, Rosemary Sea Salt, and Yerba Mate Chocolate. They are available in some local shops, at select Farmer’s Markets, and online. Last weekend might have been the last of the Somerville Winter Farmer’s Markets, but fifteen of the winter market vendors are participating in the kickoff of the Mayor’s Fitness Challenge tomorrow, Saturday, April 2nd, from 10-2 in the Somerville High School gym at 81 Highland Ave. Both Taza and Q’s Nuts will be there, so check them out! Taza also has a factory tour that sounds like it might be something to put on the list for spring. Local readers…have you been on the Taza Factory Tour? 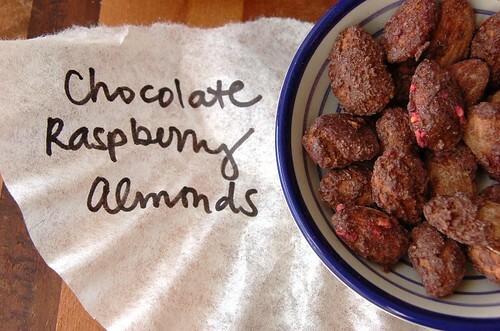 I would be all about those chocolate raspberry almonds! And I live right behind Taza, so let’s go!! I’d love to do this, Megan! Let’s plan something! I agree those almonds sound awesome. I’d be up for a Taza tour for sure. 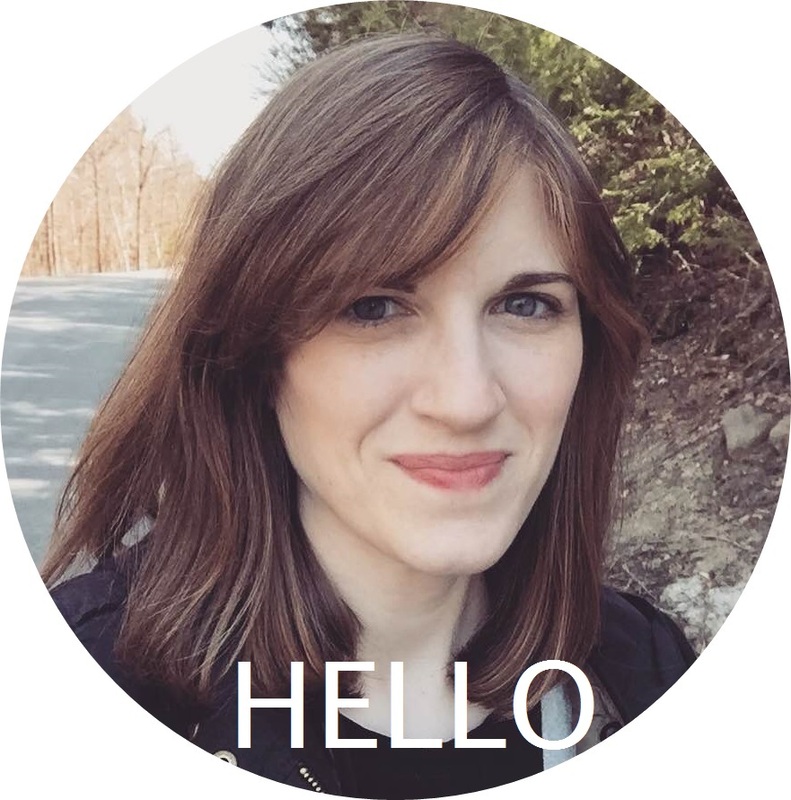 I’m finally catching up on my Apron Archives–so glad you have them archived! I feel like I must have been in a cave the past few months. All these wonderful stories I’ve missed!–and the gorgeous photos. This chocolate sounds–and looks–incredible. The nuts, too.